What a great idea, visiting other people’s gardens! Amazing! Awesome! (and, with planning) Affordable! If you were gadding around and missed the Master Gardeners’ Garden Walk or if you didn’t take the plunge for the Pond Society tour, do make a concerted effort to mark your 2010 calendar to attend both! One of the stops incorporated all manner of garden art, mostly primitive farm equipment and several unusual birdhouses. The other end of the spectrum was a beautiful English garden. Ponds fed by babbling brooks created mesmerizing atmospheres. My neighbors have even planned a mini-garden walk involving just a few families. It’s an opportunity to get better acquainted with your neighbors and visit about something besides the weather. It’s too late for a vegetable garden this summer, but there’s still time to start a flower garden involving the whole family. My favorite daughter’s second garden is a family affair reaping benefits far out weighing the harvest of peas and pumpkins. Charlie has beans on his beanstalk (Two year old Charlie planted a good share of an envelope of beans in one hill.) Catie is planning on several jack-o-lanterns. Daddy grills home grown potatoes, tomatoes and onions. The long range forecast for July is cooler and wetter weather so get in sync with Mother Nature and go for it. New beds do need to be religiously watered this time of the year to establish root systems. It’s okay to fertilize from now through the end of August. Your new garden needn’t be huge. It can be containers on the porch. If the kids are still bugging about a pet, put in a pond and get some goldfish. The fish we saw at the walks were huge and survived there through the winter. Your water feature could be a whiskey barrel size container adjacent to the deck. Now is a good time, too, to do some rearranging. We didn’t get the new strawberry bed organized quite soon enough this summer so I’m going to remove the weeds that have sprouted and cover the bed with mulch. I’ll soon be transplanting several Iris and a few Hosta over to the seeder wagon area. Some of the Tiger Lilies are moving from the ditch there to surround the mailbox in the newest zeroscape area. A horse ate the top off the sapling in that bed. I’ll need to install a taller barrier than the garden gate that I thought was such a nifty idea. Oh, well, the garden gate can become home to a climber in another location. That’s the great thing about plants and gardens. Nearly everything is portable and/or potable. The seeder wagon is in place. The lawn mower towed it out of the shed down to the water way and then with two planks and my favorite son’s strong back we pushed and pulled it to the other side of the ditch. With the addition of an old wire garden gate staked behind a sapling, a hand pump from my parent’s former home and a rock lined pseudo fire pit filled with Petunias that were on the end-of-season sale, the area reflects the peaceful primitive atmosphere I was striving for. This is the area I mentioned in an earlier blog that became inaccessible to mow due to last year’s flood. Hosta, native grasses and prairie perennials will grace the space next year. We continued our zeroscaping to include a part of the road ditch that I learned is also impossible to mow after the mower and I suffered a close encounter with the culvert. Now that waterway is filled with large rocks and what was a sloping grassy space is mulched. Hosta will ring the two Black Walnut trees in the roadway ditch. Hosta is a plant of choice there because I have some that need transplanting and they are not sensitive to Juglone, a chemical secretion from Black Walnut Trees. Discovered in the 1880s, Juglone is produced in the fruit, leaves, branches and root system of several trees with Black Walnuts exhibiting the highest concentration. The greatest intensity in the soil exists within the tree’s drip line, on an average 50 ft. radius from the trunk of a mature tree. Plants susceptible to Juglone display yellowing leaves, wilting and eventual death. Plants sensitive to Juglone include Peonies, Hydrangea, Asian Lilies, and Lilacs. There are multiple choices that will withstand close proximity to Walnut trees such as most grasses, Phlox, Sedum, Daylilies, Iris and Hosta. Now my challenge is to determine plants that are not only resistant to Juglone, but also to the deer population in this neighborhood. Unfortunately, Hosta is one of the critters’ favorite choices. They have already decimated the Hosta and Bee Balm in the ditch on the other side of the lane. A great winter pastime will be comparison shopping perennials and grasses that are both deer and Juglone resistant as well as low maintenance for those landscapes. I actually enjoy mowing. And I like the challenge of creating and maintaining flower beds, but the simple clean lines of zeroscaping does appeal to me. A few plants and shrubs easily embellish the area without overstating the purpose of low maintenance. The following is by Linn County Master Gardener, Claire Smith: My daughter’s garden is going to amount to a hill of beans. Her first family garden last year was so much fun that they planted another. Michelle dug a hole for a tomato and as she picked up the plant, two year old Charlie dumped a half package of green beans in the hole and then proceeded to cover the seeds with his yellow plastic rake, “Back and forth, Gramma, back and forth”. No problem, we’ll just use a trellis and enjoy Charlie and his beanstalk. Catie was a big help, too. She labeled a stake for both ends of the rows so we’ll be sure to know what we planted. FYI, the rows are all of ten feet long. Watering the seeds daily until they germinate hasn’t been a problem as long as no one minds that Charlie can turn on the spigot and water himself, Catie, and the neighbor’s dog. We’re waiting to mulch the plants until they sprout in an effort to keep Charlie off the rows. With limited garden space, they’re experimenting with a hanging container cherry tomato plant. The container will probably require watering daily, allowing the water to run through the container. Charlie helped us plant Hosta in their back yard this week. The family is renovating the yard so some landscaping is in order. Their home is nestled on a hill surrounded by mature trees. We planted several Hostas between a retaining wall and a tree where they will enjoy speckled sunlight. Hosta prefers a rich organic soil, but they will grow in about anything. We have access to aged horse manure to augment the soil and topped that, of course, with hardwood mulch. Michelle plans to alternate Day Lilies and Iris in a sunny spot in front of the house. Both are perennials preferring full sun and fertile, well drained soil, but once established will tolerate drought. The latter makes them a good choice for a busy working Mom with two equally busy youngsters. Annuals will supplement other spaces. Petunias, Snapdragons and Salvia are sun lovers. Impatiens are shade/part shade lovers. All are easy keepers. Eventually there will be shrubs and other flowering perennials. Michelle and her family are having such a good time experimenting with what works and what doesn’t with both their vegetable and flower gardens. And that’s what gardening should be about: family and fun! Hosta lovers won’t want to miss a talk by Bob Solberg on Saturday, Oct. 4 at the Coralville Public Library, 1401 5th St., sponsored by the Harshbarger Hosta Society. Bob has introduced more than 50 hostas to date and has plans to add five or so to that number each year. His speech, “Hostas the past 10 years,” will be 1-4 p.m.
‘Guacamole’, introduced in 1994 and Hosta of the Year in 2002 is probably his best known cultivar and is probably in your garden. ‘Orange Marmalade’ PP#16,742 is his first patented hosta and destined for a wide distribution. ‘Corkscrew’, ‘Ginsu Knife,’ ‘Baby Blue Eyes,’ ‘Coconut Custard,’ ‘Cracker Crumbs,’ ‘Barbara May’ and ‘One Man’s Treasure’ are some of his other introductions. (1998-2001). He was the recipient of the 2003 Alex J. Summers Distinguished Merit Award. 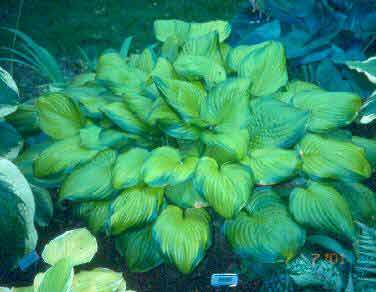 Bob is a nationally known lecturer on the subject of hostas and author of many articles on hostas. He has edited the “Green Hill Gossip” for the past 13 years and the “Gossip Jr.”, a twice yearly subscription newsletter since 2004. When the hostas are up and glowing in the garden you may find him on the road, bringing hostas and hosta stories to a town near you. For questions, contact Judi Pohorsky at (319) 396-6116.